Pick up a Tiger Woods biography. Pick up a Tiger Woods biography for kids who are interested in learning more about the athlete, the sport of golf, or who enjoy reading biographies for children. Biographies are a great way to get kids interested in reading. While these nonfiction books may not sound like the most exciting stories, if you choose someone a child admires, like Tiger Woods, the child is more apt to read and enjoy the book. Biographies of celebrities and sports athletes will help children get more interested in reading. Struggling readers benefit from reading biographies, especially of people still alive today. This helps them connect the story to the real world, featuring people, places and events that kids are interested in learning more about. 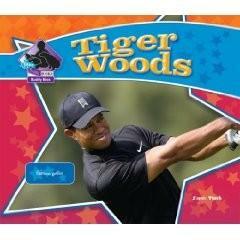 Tiger Woods (All Aboard Reading) by Andrew Gutelle: This 48-page book is geared towards children ages four to eight. It talks about not only his professional accomplishments, but also the work Woods has done to achieve those accomplishments. On the Course with. . . Tiger Woods by Matt Christopher and Glenn Stout: Upper elementary students will enjoy reading about the obstacles Woods' had to overcome in this 144-page book. Tiger Woods (Amazing Athletes) by Jeff Savage: Part of the Amazing Athletes series, this book focuses on Tiger Woods rise to become one of the most well-known celebrity athletes. Tiger Woods (Big Buddies Biographies) by Sarah Tieck: Beginning readers will enjoy reading this book filled with amazing pictures and text about Tiger Woods. Tiger Woods: Golf Superstar by David R. Collins and Larry Nolte: This books for kids in kindergarten through sixth grade, has full color illustrations to go along with the story of Woods. Kids will read about not only his accomplishments, but also the obstacles Woods faced along the way to golf stardom. Tie the projects into other subjects, such as history and physical education. Students can even do art projects, painting scenes from the books. Remember to emphasize that reading is important not only for the entertainment the story provides, but also for the information that students gain about other subjects and the world around them. Learn more about Tiger Woods by reading his biography and chronology on his official website. Biographical information, chronology of his career, famous quotes, tour schedule and more are on the site. Read an interview from 2007 published with Scholastic online, who is also known for their book clubs. Other kids may find this interview exciting to read, because a "kid reporter" conducted it. Children who are interested in athletes or the sport of golf will enjoy reading a Tiger Woods biography for kids. Whether you use is as part of classroom activities or just as a way to encourage your child to read more, a biography on Tiger Woods is a great way to interest a child in reading.